I have been making gingerbread for about 6 years now. The first one I made I took to work (I work at 2 arenas in Cleveland, Ohio) and used it as a centerpiece during the Christmas season. Some of the people I work with saw it and asked if I could make some for the following year. I have pictures of the others on my Photobucket.com page under ThorneHope if you would like to see them. I didn't submit those pictures because they contain logos. I will say I'm getting better at it. I did the lighthouse for a contest at the Cleveland Botanical gardens a few years back. I got away with the lighting by putting a track light in the base. The only bad thing about that is its gets very hot. You have to use the chimney like a real one...leave it open to let the heat escape. On the lighthouse there is a hole in the roof to let the heat out as well. I didn't win anything in the contest. 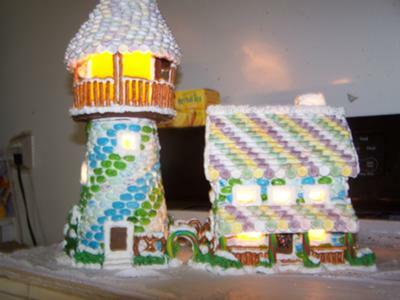 When do you think you might have a pattern for a gingerbread lighthouse?